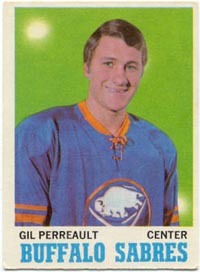 For 17 glorious seasons, Gilbert Perreault was the Buffalo Sabres. As he went, so did the Sabres. An absolute magician with a hockey puck, Perreault ranks high on the NHL's all-time scoring list with 512 goals and 814 assists, for 1326 points in 1,191 games. Perreault was the first draft choice in Buffalo Sabres history when selected first overall in the 1970 NHL draft. In 1971 he captured the Calder trophy as the NHL's rookie-of-the-year. 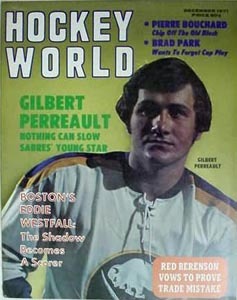 In the Sabres second year, the Perreault became the center of the famous "French Connection" line with Rick Martin and Rene Robert. "Rick Martin joined the Sabres as their first round draft pick in the second year of the franchise. In the same year, Buffalo got Rene Robert in a trade with the Pittsburgh Penguins. We clicked right away. I was there to make the plays, Rick was there to score the goals, and Rene did a little of both. All three of us were good skaters. Our style was comparable to the European style, frequently crisscrossing with a lot of speed" said Perreault, the slickest of the three. Gilbert was one of the greatest one-on-one players ever. He had more tricks up his sleeve than the rest of his teammates combined. "In my day, offensive players did a lot more skating and stickhandling, changing speed, dekeing two guys and making plays in the offensive zone. I loved the thrill of beating everyone on the ice, dekeing through the opposition. When I got the puck, I'd dare them to try to get it away from me. Its rare to see that today, save for a few players like Mark Messier or Jaromir Jagr," said Perreault, who grew up admiring great stickhandlers Jean Beliveau and Dickie Moore. Perreault was often compared to Marcel Dionne and Guy Lafleur, as those three were the top offensive players out of Quebec in their day. Perreault never reached the scoring plateaus that those two did, but many considered him to be the most individually talented. And later on in his career he became aware defensively. Lafleur of course was in Montreal and won many Cups with a great team, so he got the nod as the best Quebecer in the NHL. Dionne was way out in the obscurity of Los Angeles, and never got the recognition he deserved, so Perreault was often considered to be ranked in the middle of that French Trio. Perreault got off to a blistering start in his NHL career, a career he credited a lot of his success to coach/gm Punch Imlach. "In my first seasons, Imlach told me to go for goals and not worry about checking. That really helped me get my confidence. The first few years I was there, it was loose. I was rushing the puck a lot. We had style." He (Punch Imlach) showed me video tapes of me in games to prove I was shifting one way too much. He got me to shoot faster; not to nurse the puck for careful aiming. He also wanted me to shoot more and to cut down on what he called 'walking in' on the goalie, something I developed on finding my slap shot wasn't hard enough." Perreault won the Lady Byng Trophy in 1973 and was a two-time member of the NHL Second All-Star team in 1976 and 1977. The closest Perreault and the Buffalo Sabres franchise has ever come to a Stanley Cup championship was in 1975 when the Sabres were defeated in the finals by the Flyers in six games. Those Sabres teams were special, as the entire team was built around size and solid defensive positioning, plus the explosiveness of Perreault and his linemates. He is an oft-forgotten member of Team Canada 1972, as well as Canada Cup squads. Perreault never won a Cup, but that was his sole focus. At one point he even considered being traded in order to get that chance at the Cup. "After 8 or 9 years in Buffalo, I thought about asking for a trade. I wondered if a change would help my career. I was also curious to see how things were done elsewhere. Even the thought of going to the Canadiens crept into my head. I had grown up being a part of winning teams. I knew it would take a few years to get to that point with buffalo, but from 1974-79 we had an especially good chance. We had a lot of good years in Buffalo, but every hockey player wants to win the Stanley Cup. There was a change in Sabres management in 1979 that revived the team, and my thoughts of moving disappeared. In the end I was glad to finish with the Sabres. Perreault retired as the all time leader for the Buffalo Sabres in every offensive category - 512 goals and 814 assists for 1,326 points in 1,191 regular season games. Always humble, Perreault's career landed him the ultimate acknowledgement - enshrinement in the Hockey Hall of Fame. "I didn't enjoy attention when I played but the Hall of Fame is different. It's the greatest honour a player can have."